Have you every heard of the Power Hour Technique? There are lots of articles on how to do a power hour, but here’s a different twist on it. As an in-home child-care provider for 10+ years, it took me a long time to figure out how to work from home with young children. Running a small business from home can be challenging when you have babies and toddlers wanting your attention. I have lots of experience behind me, and am excited to share tips for how to work from home with young children. I’ve heard so many times from work at home moms (WAHM parents) who struggle with time management. Trying to work at home with little ones, working around your family schedule, naps, mealtime, soccer games, car pool lines, dance class, and appointments is hard. I’ve tried the DISC system, Franklin Covey, white boards, and planners of every kind, only to be frustrated at the end of the day when the only thing I crossed off my list was getting dressed. I recently read a book called Work Simply, one of the best productivity books I’ve come across. This book spoke to me. If only this book was available 10 years ago when I was a mom in the trenches of young children. So, what’s the trick to working from home with young children? How can you work from home without putting your children in front of the TV all day? Think PROACTIVE instead of REACTIVE! Your children don’t care about what’s on YOUR daily task list. They have their own agenda of play, learning, and discovering the world around them. Their biggest need is to be loved, and more than anything want to spend time with you. As I became more proactive when my children were small, I planned on what their needs would be, in addition to what was on my task list for the week. I started working in 15-minute increments, and found that I could get a lot done in a 2-hour time frame if I planned ahead. I did this by finding at least one focused power hour a day, M-F. I actually did 2 power hours if I could manage to get up 30 minutes earlier, stay up 30 minutes later, grab 15 minutes during naptime, or while waiting for kids in carpool. These focused 15-30 minute windows of time totally helped with what I could get done. The great thing about a focused power hour is that you can break it up in smaller sections of time, so don’t feel overwhelmed by a focused power hour. I began on Friday mornings, or during naptime, by setting my upcoming M-F focused power hour goals based on what I needed to accomplish. Since I’m in the Direct Sales / Party Plan business, I would plan my focused power hours getting stuff ready for home parties, work on hostess coaching, placing customer orders, and following up with leads. I found that once I had my weekly goal set for what I needed, then I could plan activities that would keep the kids engaged with hand/eye manipulatives, as well as small and large motor activities while I worked. My power hour technique might look different than yours depending on what needs to be done. You can use the power hour technique for chores, or just about anything that needs to be tended to with focused determination. The power hour technique I used when my children were little was intentional and just like it should be, very focused. I had a closet full of bins where I stored various activities for the kids. To keep them from getting board, I would switch out items and change things up. I used a range of activities depending on what I needed to get done in a certain block of time. A 30-minute window before the kids get up and/or after the kids go to bed (Pick ONE task and FOCUS on it): Package orders, place orders, send recognition, run team reports, send customer news letters, send online customer thank you cards, planning for parties, plan for team meetings, or fill out bank deposits. Whatever the task, focus on it for 30 minutes. This won’t require any planned manipulatives for kid’s activities – YAY! A 15-minute window with BUSY KIDS activities (Pick ONE task for 15 minutes and focus on that ONE task only): For each 15-minute block of time, you’ll need one planned activity to keep the kids busy. The activity will depend on what YOUR task is. Need to make phone calls and/or can work at your kitchen table or counter? Lay out 1 activity for the kids, get them set up, show the kids what the activity is, let them know they can’t talk to you until the timer goes off, set the timer and GO! It may take some getting used to, but they will get used to it, and they’ll actually look forward to it. They key is that you only do these activities during your power hour blocks of time, AND you don’t allow each activity to go longer than 15 minutes. Once the timer goes off, it’s time to clean up the activity –otherwise they get board. If it’s a craft, then YOUR time will be up in 15 minutes, but they can complete the craft. While I was an in-home child care provider, summer-time and school holidays were the most difficult. Believe it or not, school-age children were harder on my house, and made bigger messes, than my toddlers. I found that by planning ahead, just like with toddlers, I could have activities planned for them while finding windows of time to use the Power Hour Technique. Most of the activities for bigger kids involved using bigger manipulatives: creating obstacle courses, reading to the younger kids, decorating cookies, making some of the manipulatives for the younger kids (and they thought they were just making a craft), or even helping to label products and catalogs. Big kids get board too, so you still need to set the timer for 15-minute windows of time. 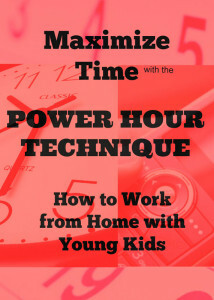 Once the timer goes off, then put your work away and be done with your focused power hour window of time. The goal is to have one or two hours, broken up into smaller windows of time, 5 days a week. If you have 2 Power Hour sessions a day (that’s only (8) 15-minute segments), that will give you 10 hours a week to spend on your Scentsy business, or other small businesses. There are days where everything still might fall apart. There are days where the baby might be sick, or the kids are fighting, it’s understandable. I’ve been there! The great thing about using the Power Hour Technique this way is that you are in control of your time. You’re being intentional with your business by focusing windows of time to work, and still engaging with your kids in educational activities. I call that a WIN/WIN! It’s very important that you strategize before each window of time. You don’t want to spend your Power Hour planning whom you’re going to call. The idea in using the Power Hour Technique is to be engaged in an activity, preferably a money making activity like following up with customers, booking parties & events, hostess coaching, following up with leads, etc. Make Your Power Hour Time Fun! Make your power hour time fun by engaging young kids in activities. If you do it right, you’ll be adding meaningful, focused time to your business, and creating strategic plans to have fun with your young kids. It’s a great opportunity to teach them how to work and have fun at the same time. Keep it fun, and don’t get upset if the day doesn’t go as planned. There’s always tomorrow to put in another day of work. In Carson Tate’s book Work Simply that I referred to earlier, she says that time is NOT equal to money because you can NEVER get time back. She’s right! Use the Power Hour Technique to focus and work smart. This will give you more time with your family, and hopefully more YOU time too.